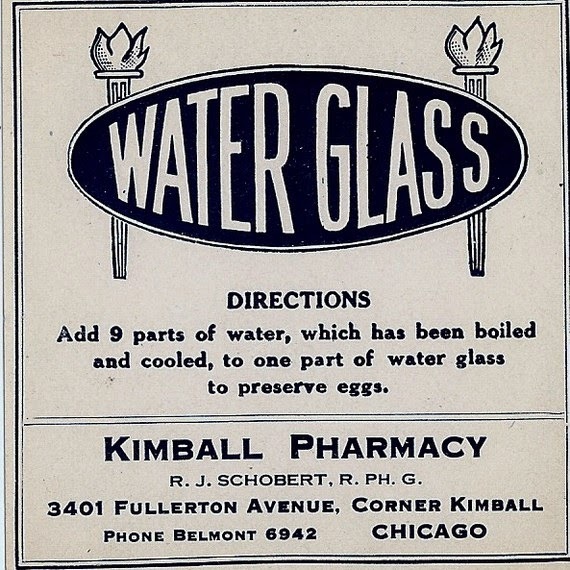 Vintage 1920's Water Glass Label. 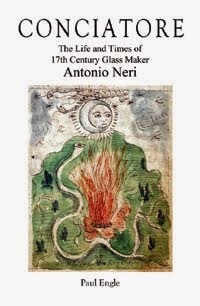 The temperature of 1500 degrees (825 C) was comfortably within reach of seventeenth century glassmakers like Antonio Neri. It was also achievable in much earlier times and was used in one of the earliest chemical reactions of human industry; the production of "lime" by heating seashells or limestone to the above mentioned temperature. This is the point at which these materials give up the carbon dioxide gas bound into their chemical structure, leaving behind calcium oxide, otherwise known as lime. What makes lime so useful is a property early Roman engineers knew well; that when mixed with water, lime undergoes a chemical reaction that releases heat and quickly solidifies into a rock-hard mass that is impervious to the elements. The Romans used it as a construction material; they mixed it with ash, clay, sand and stones to form mortar, cement and concrete. It has played a critical role ever since in the construction of buildings, roads and monuments. Today it is perhaps not an obvious choice in imagining the supplies of a seventeenth century alchemist’s cabinet; lime does not require exotic methods to produce, it was made in industrial quantities and readily available as a construction material. Nevertheless, lime played an important part in many diverse chemical preparations of the day. Antonio Neri mentions it numerous times in his writing. He used it in his lute recipe; a hard, cement like coating which protected alchemical glassware in direct flame and sealed joints. He also used it to extract the color from flowers in the production of paints. Most notably, he used lime as an ingredient in the formulation of glass itself. Lime turns out to be a rather critical ingredient in glassmaking and the central player in a mystery about the history of glass that to this day has not been satisfactorily explained. Neri obtained the white powder from suppliers as "lime cake." Early in his book, L'Arte Vetraria, he states it should be used in all his glass recipes. Take lime salt, which is used for building. Purify this salt and mix it with ordinary Levantine polverino salt in the proportion of 2 pounds per 100, which is 2 pounds of lime salt, to every 100 pounds of polverino salt, purified and well made, as previously described. With this salt mixture, you can make yourself ordinary frit, and put it in the crucible to clarify. I will refer to this frit from now on in the recipes for cristallino, cristallo, and common glass. This way you will have cristallo quite subtle and beautiful. The above excerpt is the full extent of Neri's discussion on lime in glassmaking. An interesting point here is that he does not say why lime is so necessary. He must have known that adding too much lime will cause glass to become cloudy, the exact opposite effect that he is after. What is not so clear is if Neri (or anyone else) understood that too little lime allows glass to dissolve slowly when exposed to water. One of the great enduring mysteries in the history of glassmaking is the question of exactly when it was understood that lime was so important. The subject became a matter of deliberate chemical investigation in the eighteenth century, but the use of lime extends much earlier. Some of the earliest glass fragments known contain healthy amounts of lime. Neri's ambiguous endorsement is the first mention in print, but even among much earlier manuscripts, its role is unclear. In the first century, Roman author Pliny made a cryptic reference to adding seashells to the glass melt, but again, without further explanation. Analysis of ancient glass often shows a significant lime content; seemingly more than could be reasonably accounted for by happy accident or contamination. The ingredient is never mentioned in most surviving early recipes. Of course, it may be that lime is present in many ancient glass artifacts precisely because those artifacts are the ones that have survived without dissolving. Some have speculated that calcium could have been introduced inadvertently as seashell fragments when sand was crushed into powder for glassmaking. This hypothesis is certainly possible, but it seems suspect considering just how much seashell would be required and how fussy the glassmakers were in obtaining pure white sand from particular locations. However, a distinction must be made between knowing that sand from a particular location makes good glass, and knowing what is in that sand. Perhaps the most famous such site for good glassmaking sand is the "Belus" [Na'aman] River outlet in what is now northern Israel. This is where the story of the discovery of glass takes place, as told by Pliny and other early writers. Sailors were driven here by a storm, they used natron (glassmaking salt)  from their cargo to hold their cooking pots up over a beach fire, and when the natron mixed with the sand in the fire, glass was formed. Or so the story tells. The nearby Phoenician cities of Tyre and Sidon are known to have hosted a thriving glass industry. The sand in this area is composed of exceptionally pure quartz, with a healthy amount of calcium from shells ground down from wave action. Together these make an ideal mix for stable glass. There is some evidence that experimenters such as Basil Valentine were aware that glass without lime would dissolve as early as 1520. For what it is worth, I can contribute some anecdotal evidence from the twentieth century. 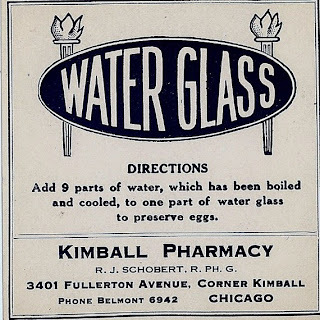 There is a well-known product called water-glass that is essentially composed of dissolved glass without the lime. My glass artist friend Emilio tells me that growing up on Murano in Venice, his mother regularly preserved fresh eggs by dipping them in water-glass, which when dry, formed a hard seal over the existing shell. Presumably, she learned the technique from her own mother. I do not know of any early references, but the use of water-glass clearly indicates a knowledge of the role lime played. There are other explanations possible for the addition of lime to glass. Lime was a commodity that was made since ancient times, in furnaces very similar to the ones producing glass. In fact, Neri specifies the use of a “limekiln” for the production of his enamels. The archaeological remains of Tyre and Sidon show prolific use of lime based plaster and mortar in their construction practices and there are indications of lime making facilities. It seems only good business sense that the same furnaces making glass may have also been making lime. Cross contamination, and even experimentation would be a natural outcome. As an aside, magnesia (MgO) can also serve as a stabilizer in glass. Pliny, Natural History v.36, ch. 66.192. Natron is a mix of sodium carbonates. Basil Valentine, et al. see footnote 6 of the Wikipedia article on sodium silicate for a discussion. * This post first appeared here in a slightly different form on 10 October 2014.